There are photos from 2001 - 2016 from many volunteers. We'd love to include them all. Please contact us if you're interested so we can discuss uploading options. The following images and moving pictures are from various entities from different events throughout the years. Throughout the years since 9/11/01 a community of Ground Zero volunteers pay tribute to our nation's veterans, people lost due to September 11, 2001, the following war and Ground Zero related illnesses. This video displays some of the memories we've shared. Every September since 2002, our group of Ground Zero volunteers has united in remembrance of all who were lost September 11, 2001 and in tribute to our brave women and men of our military. Many of the September 11th, 2001 volunteers appear in a documentary film about Ground Zero titled - 9/12: From Chaos to Community. From WCBS-TV in NYC: Veterans Day 2009. With brief clips of the Vets Day Parade, the Ground Zero Flag, & the US New York. 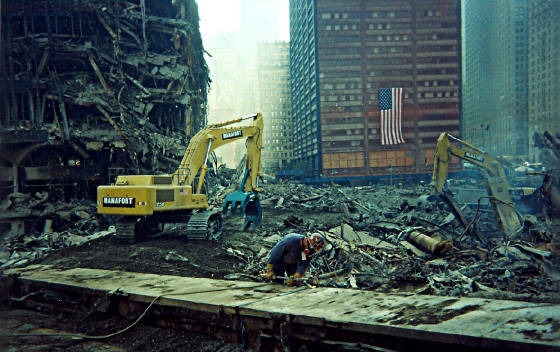 The Ground Zero Flag was first displayed on September 22, 2001 on the Church Street side of the Brooks Brother's Building at 1 Liberty St., which at that time was being used as a temporary morgue and triage center. On a blue skied September day in 2007, The Ground Zero Flag & a group of Ground Zero volunteers prepare for the Annual Flag Ceremony that's continued each year since the terrorist attacks of Tuesday 9-11-2001. The Ground Zero Flag was proudly displayed on the Intrepid Aircraft Carrier as it returned to New York City after repairs. http://www.thegroundzeroflag.com/ This 60' X 30', 92 lb. American Flag was donated by The Valley Forge Flag Company.